Listen to “Gracie Wins Wisconsin” from April 20, 1940. 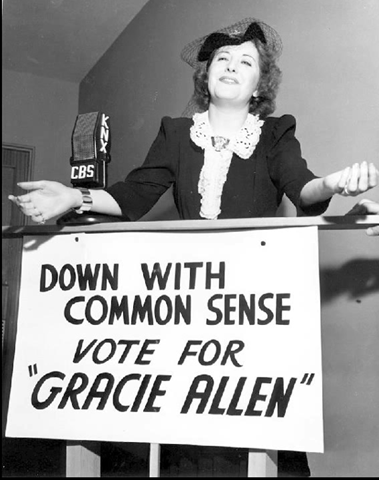 No matter if you’re voting for Clinton or Trump or Stein or Johnson—I think we can all agree that Gracie Allen would be this—or any—year’s ideal candidate. Every presidential election has its gag celebrity candidate (and you can insert your own Clinton or Trump or Stein or Johnson joke here). I’m old enough to remember Pat Paulsen, Snoopy and “Pigasus the Immortal” running in the ’late 60s, though I just missed Jayne Mansfield’s “The White House or Bust!” campaign of ’64. England had Screaming Lord Sutch of the Official Monster Raving Loony Party running for Parliament from 1963 till his death in 1999. I’m sure searches of newspapers would find gag candidates running all the way back to the 1780s. As we suffer through the last few months of this election, enjoy the song stylings of Gracie Allen, running on the 1940 Surprise Party platform (keeping in mind that, like all politicians, she did not write her own material—George Burns, and his brother Willie were the credited writers, but you know darned well a lot of nameless gag-writers got underpaid for much of the material). This entry was posted in 1940, Eve Golden, Radio and tagged 1940, Eve Golden, Gracie Allen, radio. Bookmark the permalink. I don’t know if Gracie Allen could have led us through WWII like Roosevelt, but she sure would have baffled Hitler and Mussolini. I can’t stand Gracie Allen, mainly because of her voice, but the gimmick was good. It was clearly even more of a joke since FDR was a 4 time elected president. The odds she would actually be elected was minuscule so the joke was especially funny. I just wish her voice wasn’t like nails on a chalkboard to me. Well, I for one ADORE Dear ole’ Gracie. Listened to her on radio, watched her on TV, and laughed every moment. Even have CD of the ‘election’ series. I take it whenever election things are happening. Afterall, she, for one, would have made more sense with reality than BUsh-itE ever did during his dreadful years. VOTE FOR GRACIE AND WE WILL ALL HAVE A GREAT TIME!